As I was finishing up the rag quilt, I knew I was going away for the weekend and i was invited to attend a 2 year old's birthday party. I was trying to think, where in my tons of quilting magazines did I see a Birthday Cake. After some searching, I finally found it. 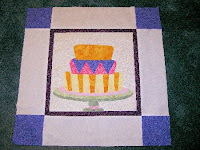 It was in a previous Quick Quilts magazine and it was the Heidi Pridemore "Birthday Go Round" design. The question is, would I have enough time? I was able to select my fabrics and create the basic back block on Sunday and then cut out all the paper templates and their subsequent fusible web pieces. I used a lot of the Timeless Treasures fabric with Metallics. Here's a great place to see and purchase them. OK, so I have my fabrics, I made the square on Sunday, I have my fusible web cut out as the pattern pieces. On Monday, I applied by fusible we pieces to fabric and cut out all the fabric pattern pieces. 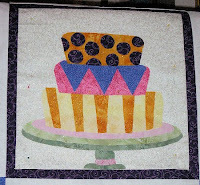 From there, the fabric cake assembled pretty quickly. 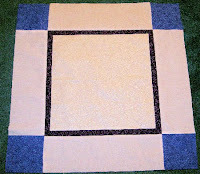 I ironed the patten to the background square. As of last night, I have the full cake and icing completed and I have the candles completed. It's just that I decided to try and figure out how to make the candles interchangeable each year. Since she's only 2, I want only two candles. Next year, her mom can add another candle.